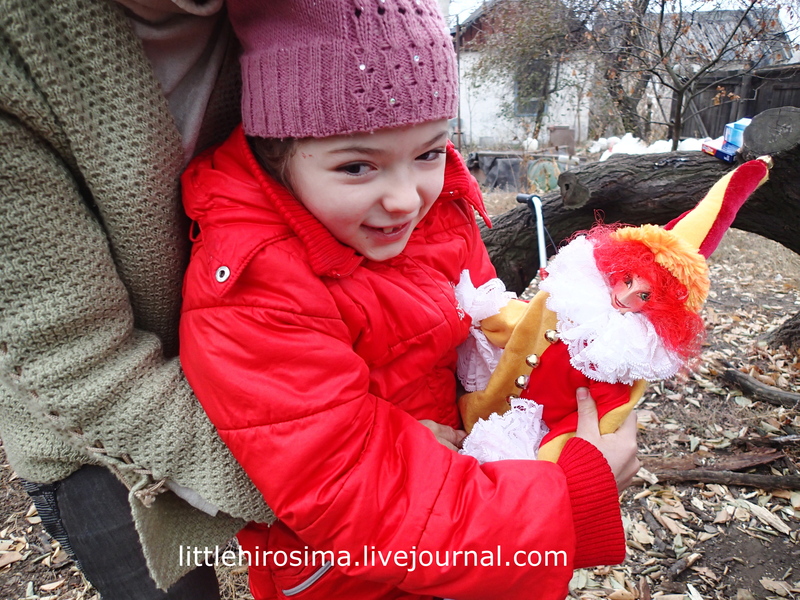 Smile, Veronika! 5 out of 5 based on 9 ratings. 9 user reviews. 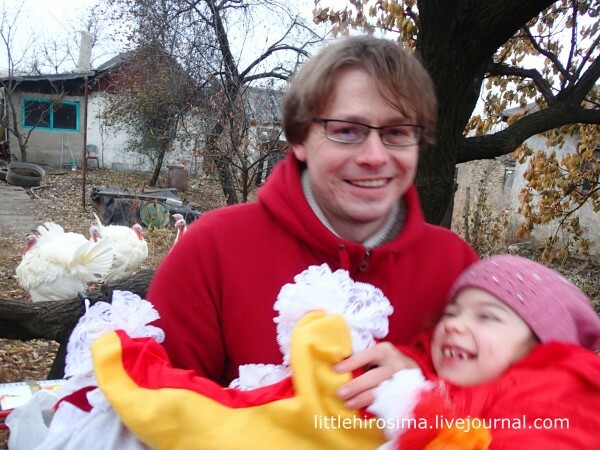 –Veronika, can you go to the auntie? The girl nods in embarrassment. –Like my daughter. You hear? I have a daughter just like you. 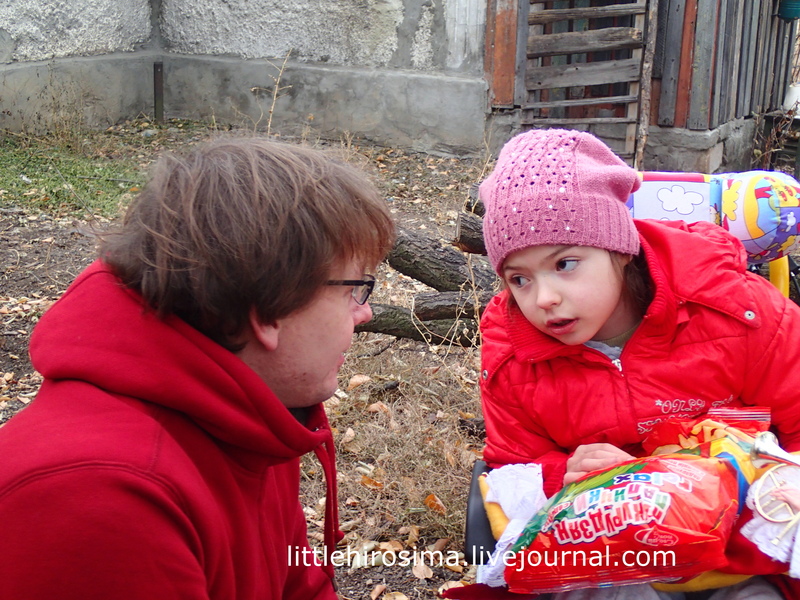 We met Veronika and her mom, Larisa Emelina, during our previous trip, in September in Pervomaysk. She gave birth late, at the age of 43. There is no father–he died shortly after she was born. A tragic accident. Larisa is raising her daughter by herself. She started to suffer from epilepsy at the age of one after a vaccination. 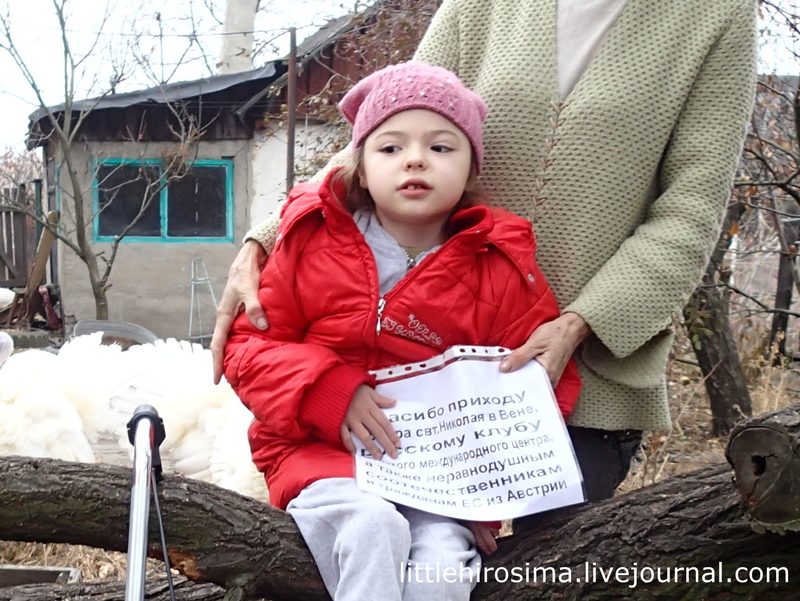 One way or the other, Veronika can’t walk and suffers from seizures. Her legs are weak and bent. We were just about the first people to hold her, other than her mom. 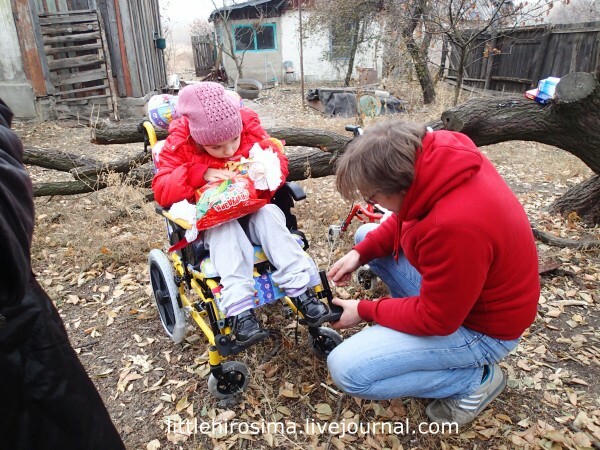 Veronika was made so nervous by our arrival that her legs began to shake. Zhenya took her from me and started to spin. And Veronika suddenly started to laugh. Up to then she was a scared little rabbit. Then she suddenly opened up. I look, and her mother is wiping tears. Last time we visited, Larisa carried her daughter the whole time. 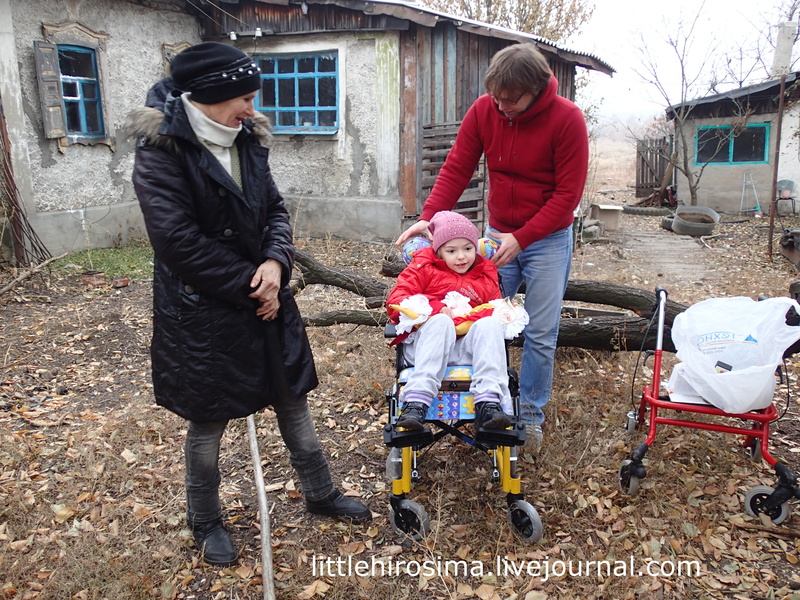 She said that her carriage is too small and asked for a walker or a wheelchair. I wrote a post on the subject and almost instantly got a response. Veronika couldn’t tear her eyes away. It has pictures, it is merry and sunny. The photo below shows the walker on the right. Veronika has a hard time with it. But it’s necessary. And very important. Walking is hard, but one has to practice and develop the leg muscles. 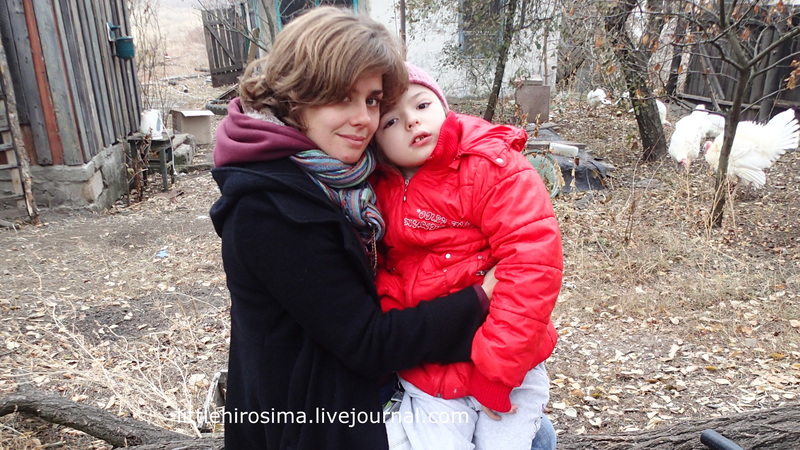 Larisa lives in her own house on the city outskirts. They have no contact with almost anyone. Larisa is practically a grandmother. Her daughter and her husband live a few houses down the street. But even with them they have few ties. But Larisa is an active woman. She has a garden full of turkeys. A big enclosure. Lots of shells fell close to the ouse. –Last summer they bombed us from aircraft. Veronika sat here on a chair under the apricot tree. I stood there, and saw how they flew right overhead. I froze with terror and couldn’t even move. My older daughter is running through the gardens, screaming. She jumped into a ditch and lay there. I stood still, could only look up, as if I was completely paralyzed. But they missed…Thank God. The house is on the outskirts. Close to the “ukrs”, as they say. Larisa has nowhere to go. –Who needs me and my daughter? Here at least we have a garden, a home, a life. We gave her a doll. I’ll tell you about it later. And about a few others. Veronika wouldn’t let go of it. It is hand-made and beautiful. It got the name Dunya even though it is a boy. “Dunya” has green eyes, like I do. But it arrived here from afar, from overseas. I held Veronika again when the wheelchair was being adjusted. –She’s a smart and talkative little thing. Could you recite the poem about the raccoon?